Civilian Public Service, camp 107, Three Rivers, California. Telephone line men. 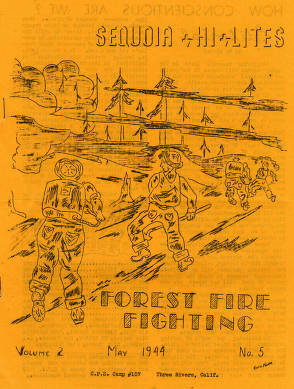 Sequoia Hi-Lites was a newsletter published by the men at Camp 107 from July 1943 to December 1945. 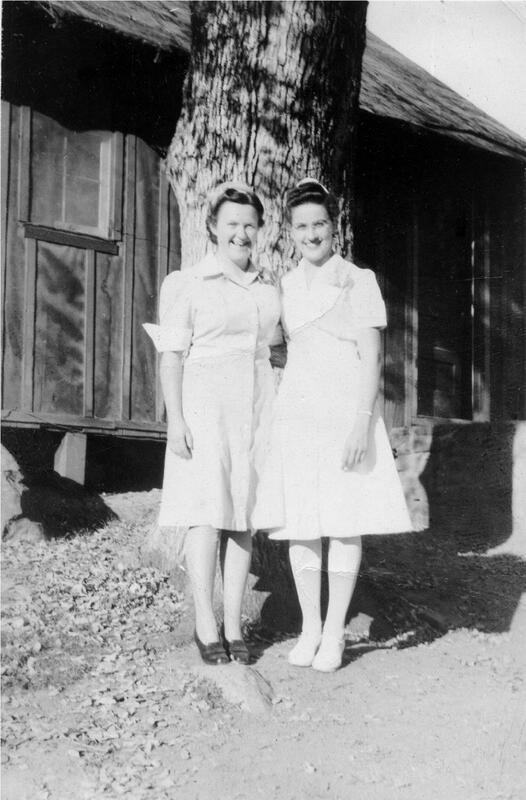 Caption on back of photo reads: "Our dietitian Naomi Brubaker and nurse Mabel Pfile at Camp Buckeye, Three Rivers, California." CPS Camp No. 107, a National Park Service camp located at Three Rivers, California and operated by Mennonite Central Committee, opened in May 1943 and closed in June 1946. Men fought fires, engaged in preventive work, repaired trails and maintained roads, along with other duties. This last Mennonite camp with the National Park Service was located about eighty miles southeast of Fresno, California and seven miles north of Three Rivers. The camp, in the foothills near the entrance of the Sequoia National Park, was isolated. To catch a bus or train, the men made a thirty-five mile trip into Visalia. Within one hundred twenty miles of the camp, men could find nearly a dozen Mennonite churches. The camp opened in May 1943 when CPS Camp No. 39 in Galax, Virginia moved to Three Rivers. It closed in June 1946. One in every ten men in Mennonite camps or units served in the National Park Service. Typically, the majority of men serving in the Mennonite camps reported Mennonite denominational affiliations when entering CPS. At Three Rivers, some twenty-five men had reported Russian Molokan affiliation when entering CPS. The first camp director, John Duerksen, also served as camp director at Galax. Prior to CPS he taught music at Hesston College in Kansas. The men worked primarily to prevent fires through pre-suppression, and then to fight fires. In fire season, the men dispersed to side camps, some as far as eight miles distant. In addition, the men worked to control blister rust, repaired trails and maintained roads. They also performed stone masonry work. During the life of the camp, the men performed 4,948 person days in fire pre-suppression and 903 days fighting fires. In the final two years, the men spent 459 man days stocking streams with 388,000 fish. The men reportedly had considerable difficulty agreeing on standards for camp life. Camp staff reported challenges in working with the camp religious diversity, describing the Russian Molokans as “obstructive”. In addition, the Park Superintendent John R. White reported “constant bickering between different religious groups” at the work site. To ease tensions while at work, White assigned the Russian Molokans to one of the spike camps during fire season. However, when not in fire season, tensions in camp life continued. From July 1943 through December 1945, the men published a camp paper Sequoia Hi-Lites. The paper replaced the Blue Ridge Bugle when CPS Camp No. 39 moved from Galax, Virginia to Three Rivers. From August 1944 through December 1945, a group of the men published The Molokan. 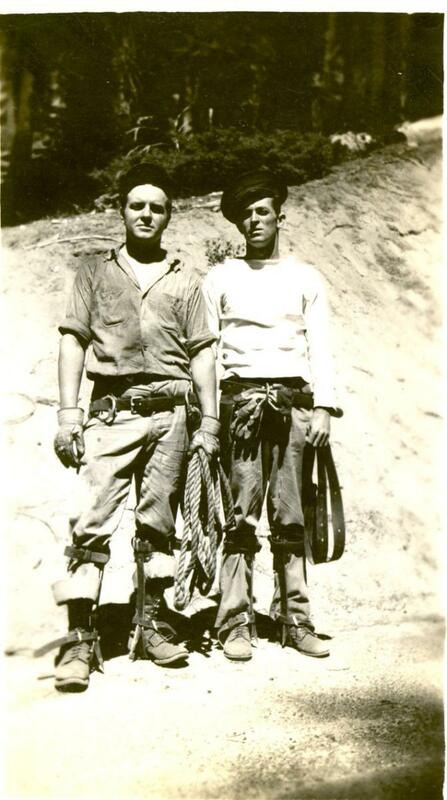 In 1945 the men published On Sequoia Trails, similar to a college yearbook. It told the story of camp life and work. For information on Philip B. Stanley, see Robert C. Cottrell, Civilian Public Service in World War II: conscientious objectors as firefighters for the National Forest Service. Jefferson, NC: McFarland& Company, Publishers, 2006, pp. 25-38. For more information on Mennonite forest service camps, see Melvin Gingerich, Service for Peace: A History of Mennonite Civilian Public Service. Akron, PA: Mennonite Central Committee printed by Herald Press, Scottdale, PA, 1949, Chapter XII pp. 149-161. See also Mulford Q. Sibley and Philip E. Jacob , Conscription of Conscience: The American State and the Conscientious Objector, 1940-47. Ithaca, NY: Cornell University Press, 1952. Swarthmore College Peace Collection, Camp periodicals database.